Using my set I was quickly able to identify the Rom board as being faulty. First off I pulled and verified all the roms, they were fine, even the one with the strange soldered leg! I did note that 2 of the TTL ('139 & '245) had very rusty legs, strange as all the other chips were fine. 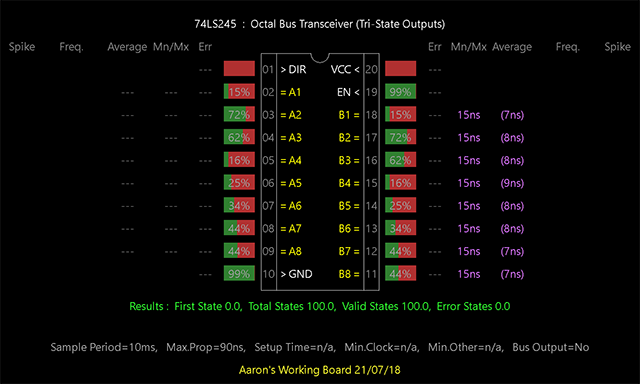 So next step was to use my tester and go over all the TTL, I did this on my working board as well for reference. First up was the '245 at 8C. As you can clearly see the chip was faulty. So I cut it out and replaced it. This got the board running, but corrupted. The title screen would be drawn correctly but as soon as the Williams circular logos started moving around the screen they would get more and more corrupt, then once the game screen came up it would invariably reboot. Sorry but I lost the pics I took of this!!! Anyway more testing and I came to the '139 at 3B (the other rusty chip). Again, it was quite obvious this chip was bad. Once it was cut out and replaced the rom board was perfect. Great repair! Lovely to see the board running again. Moved to Fix Logs. Now please tell us all about the in circuit IC tester you're using! Another brilliant repair by Aaron. I have seen this tester in action and it’s an amazing piece of kit. Saves time and hassle anabling chips to be tested on the pcbs. I also need one of those testers in my life! Great work. Would really like to know what chip tester that is though! The chip tester is something special. Designed by Aaron and works a treat. I’m sure when he has it fully tested and ready to go he will explain all aboht it and all it’s amazing features. He is a top man with never ending knowledge on this stuff. You are way too kind Steve. There are very definitely areas that my knowledge is lacking but thats for another day. It is basically a very fast logic analyser hooked upto a windows PC running some custom software of my own design. The LA is a commercial one produced by an American company. With my software though, it is like having 20 logic probes connected to each pin at the same time while also adding the ability to know what the chip should be doing. Oh and it will also calculate clock frequencies on any pin that has them. It works on live running boards with no need to disconnect anything in the circuit. This is a different way of testing to a Boardmaster as it can only analyse what the chip is actually doing in the circuit, it does not have control of the chip. Gauntlet, Atari System 1 x 2, Super Cobra, Burger Time, Robotron, bootleg Gyruss, Congo Bongo. The one area that can cause issues is when a chip is bus connected as the pins can be driven by other chips on the bus. I am implementing a Bus Mode which will only check the outputs when the inputs change but it is not a perfect way to test this type of use. The other major addition to the program is a Project Mode which you can setup as you are testing a board. This way you can assign a location to each chip as you go along in which case all the chip parameters will be stored separately for each location making retesting much easier. You can then also store 1 or more result screen grabs for each location. This will make it easy to make available Project Folders for working boards so that you can see the results you should be seeing from any board location. It is just about finished, just needs a little bit more testing. The hardware isn't cheap though and the software will also not be too cheap. But this means I should be able to give this product my full support and continue development as and when new ideas come to mind. This is super exciting for me to read about, and something that would be VERY useful to me for regular use. I have a logic analyser (Intronix LA1034) that is a nice piece of kit, but to get it set up onto a TTL chip and then try and work out what each pin was doing gets quite time consuming. I've started making pin assignments for a few of the TTL chips I've clipped on to, to at least make it easier to have a 20 pin IC clip that can be clipped on, load the chip type and have named pin signals, but it's still a lot of time to go through each pin signal manually and work out what is or isn't supposed to be happening. The logical conclusion (pun intended) of this would be to have some PC driver software that could hook into the LA data and do more of the work for you, but as ever time to make all this stuff is the problem. I never got any further than exporting the csv file from the LA, and dreamed of having a software API to grab the data live from the LA. I did searches to see if there was any product that could do this sort of thing, but have not seen anything close up to now. I've spent a lot of time using an ABI Boardmaster 8000, hoping that would do most of this sort of work, but after using one was disappointed there wasn't something more like what GadgetFreaks device here looks like. The 8000 is a very expensive device and is pretty hard to drive. I seemed to get a lot of false negative results unless the parameters were tweaked for each individual chip you're testing, and that takes an awful lot of time to set up. The stand alone chip tester (out of circuit) is good, just the in circuit testing that didn't seem to live up to the claims (or maybe just my wishes!). One problem the ABI 8000 did highlight that will also cause trouble with any clip on chip tester is the state of the PCB/chips being tested. If you have a nice clean PCB with bright shiny chip pins, with no solder bumps or kludge wires, then great. But corroded pins or pins with kludge wires on and you're always going to have problems. I spent a lot of wasted time with the ABI 8000 trying to get chip pins cleaned up enough to get a good test result, and then you were never sure if it was a proper result or not. They were particularly badly corroded pinball PCBs I was working on at the time though! So to see something like GadgetFreak's tester here has my immediate interest! What sort of logic analyser are you using? 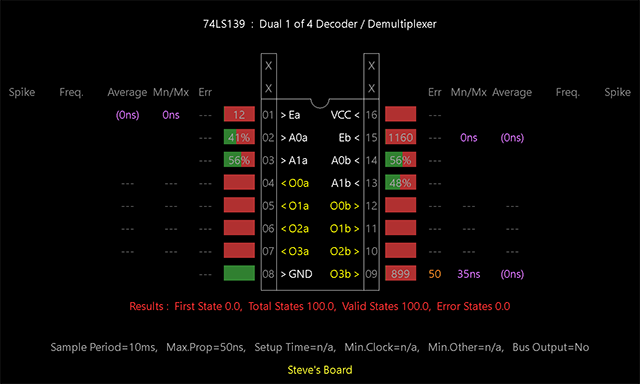 Add three more separate logic inputs for clock, start and stop signals so that then each TTL chip pin can have a live 16 bit signature generated for it. Use the same format as the HP 5004A signature analyser. Then have a software button to capture all signatures for that chip, and a compare against a known good chip signature. That would immediately speed up Battlezone and Tempest math box fixing, and allow more new PCB signatures to be made up much more quickly. Thanks for the informative response. I too had looked at getting a second hand Boardmaster but was put off by comments suggesting having to hack the board to use it properly. 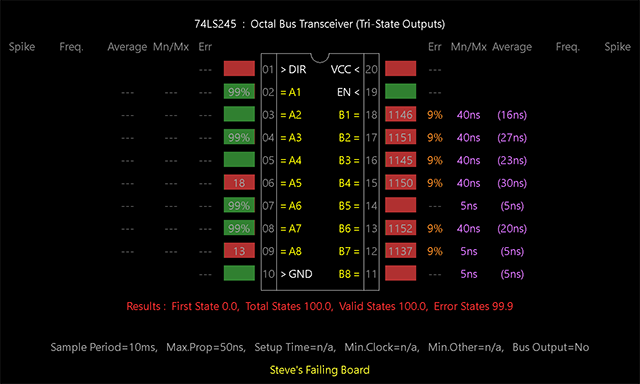 I have around 5 LA's and numerous FPGA boards that all have failings when it comes to what I was trying to achieve. I have even tried high speed micros but the common problems were either not fast enough or not enough storage. 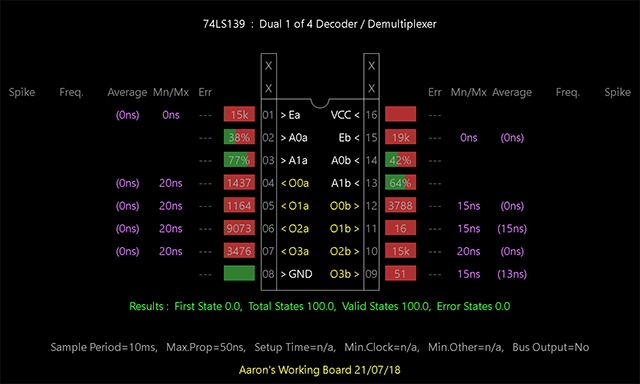 I was originally going to do all the work in an FPGA but with TTL timings varying between brands/types and the propogation delays inherent in more complex FPGA designs I ultimately decided this was a no go. The LA I am using can go downto 1.25ns but only with 8 lines, it can do 2.5ns with 16 but I am using 5ns as I wanted to do 20. Unfortunately it is also the most expensive LA I have bought so far! I know what you mean about decoding TTL in standard LA software, you end up going High/Low blind and start confusing highs on one pin with lows on the preceding pin! I am going to add a trigger option so you can set the sampling to start when 1 or more pins change state or go high/low. The signature possibility sounds interesting, I do have spare pins. I forgot to mention about chip legs. I have tested numerous boards/chips and have had some issues with this, especially with the 3M clip that I was originally using though I did find rocking the clip a little would often give it enough 'bite'. But recently a came across some clips here in the UK by a company called Warwick that are called 'knife edge' clips and so far I have found these to give better connection than the 'spoon' type that is more common. I originally thought 'knife edge' would mean pin damage but this has not proved to be the case. I can't stand the 3M clips, I use the AP branded ones where possible they're much nicer. I (and maybe quite a few others!) would like to know what logic analyser is needed for this, not sure if there is a reason why you would not want to let us know in which case could you give us a rough idea of the logic analyser price? This is a different way of testing to a Boardmaster as it can only analyse what the chip is actually doing in the circuit, it does not have control of the chip. I wish it did! I did look at ways of doing this, using weakly driven outputs per pin, dual comparator's, but all of them would really require custom hardware or have a speed impact on the sampling. I recently repaired a Deco Burger Time board, numerous chips had unused, untied floating inputs. So much for good practice!